Fiction – paperback; Scribe; 384 pages; 2018. At 11:50 am on 15 October 1970 a giant span of Melbourne’s West Gate Bridge fell 50 metres into the water below, killing 35 construction workers and injuring 18 others. It was two years into the construction project designed to provide a road link between Melbourne’s western suburbs and the city. I was just a baby when Australia’s worst industrial accident occurred, but for many years I would travel under this bridge and see the memorial plaque erected by the bridge workers and be reminded of the tragedy. When I was a university student and living in nearby Williamstown I stopped and read the names on the plaque: most are Italian or Greek. 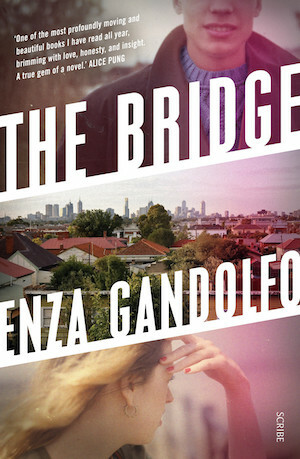 Melbourne author Enza Gandolfo takes this accident as the starting point for her richly written novel, The Bridge, which has been shortlisted for this year’s Stella Prize. The book is divided into two main sections: 1970 and 2009. In the first section we are introduced to young Italian immigrant Antonello, a rigger on the bridge, and his young bride Paolina, a teacher. Nello, as he is known, is a bit of an introvert. He’s not particularly sociable, but will go for an after-work drink on a Friday, choosing a glass of red instead of a beer, which sets him apart from his work colleagues — even the other immigrants who drink beer to try to fit into Australian society. He also spends his spare time by the river where he draws the landscape and the bridge. When the bridge collapses on that fateful October day Nello survives, for he’s swapped his shift with another chap, which means he’s not up in the rigging when the accident occurs. But later, as he comes to terms with the death of so many of his co-workers, including the man who mentored him and gave him his first construction job, Nello becomes even more introverted, plagued by survivor’s guilt and what we now know as PTSD. He does not want to talk about what happened. He does not even want to look at the broken bridge. He wants them to pull the whole thing down. In the second section we meet 18-year-old Jo, who lives in a rundown house, between the bridge and the Mobil oil terminal, with her mother, a supermarket worker. It’s her last year of school and everything is changing. Her close relationship with best friend Ashleigh, who is more glamorous (read less working class), feels under threat because Ash is spending more time with a new boyfriend. Ash is also more academically inclined and wants to pursue a law degree; Jo would be happy working as a waitress somewhere. Ultimately, it means when school finishes, the pair will probably go their separate ways. Jo’s story, of a teenager having to come to terms with growing up and the reality of adulthood, mirrors Nello’s — but with an even darker edge. I don’t want to spoil the plot, so please skip the next paragraph if you plan on reading the book, but Jo makes a bad decision that will have devastating consequences for many people, including Nello. What does she do? She drives her friends, including Ashleigh (who is Nello’s granddaughter), home from a party, crashing the car underneath the bridge. She walks away from the accident, but one of her friends dies. Jo had been drinking and is charged with culpable driving. The rest of the book then charts the repercussions of that wholly avoidable tragedy. I have to admit that I might have abandoned this novel mid-way through were it not for my project to read all the books on the 2019 Stella Prize shortlist. I think it was the unrelenting bleakness of it all. There’s so much heartache and suffering in this novel and much of the emotion, so desolate and painful, felt claustrophobic. I wondered if the story was going to go anywhere. But this is why it pays to never give up on a book, because by the end of this story — which has a hopeful and redemptive ending — I had tears pouring down my cheeks (I still feel upset writing this review several hours later) and I know this story, of two people a generation apart coping with terrible tragedies but doing the best they can, will stay with me for a long time. I especially like how Gandolfo, who writes in an elegant and restrained manner, explores themes related to class and family, guilt and shame, tragedy and redemption. She is also wonderful at capturing people’s inner-most thoughts, especially their fears and self-doubt, and showing how the tiniest bit of anxiety can spin out of control to create problems that were never really there in the first place. Her dialogue, whether that be between mothers and daughters, or husbands and wives, or work colleagues, or teenage girls, is spot on: alive and believable and authentic. In fact, the characterisation is absolutely superb in this novel whether it be a troubled teen (Jo), a guilt-ridden mother (Mandy), an angry but forgiving grandfather (Nello) or a court-appointed lawyer plagued by body image problems (Sarah). And her descriptions of Melbourne’s western suburbs — of Yarraville and Williamstown (which have both played important parts in my own life) in particular — are pitch perfect. Indeed, it almost feels like these places are characters in their own right, as is the bridge that forms the central focus of this extraordinarily moving novel. I know that Lisa from ANZLitLovers and Kate from Booksaremyfavouriteandbest admired this novel a lot, too. This is my 6th book for #AWW2019 and my 5th for the 2019 Stella Prize shortlist. This one is currently available as an ebook in the UK and will be published in paperback in November. Thanks for the link Kim. Like you, these characters will stay with me, particularly Mandy who I felt was in an impossibly difficult situation. I thought the ending was fantastic (and had wondered at various points during the story how it would end). About half-way through this one I would have given it two stars, but that ending, helped by the emotional weight of everything before it, elevated my rating to four stars. It’s rare that that happens. I think you loved it more than me; the book didn’t really gel for me until the end, but I know it’s a story I will think about for a long time. Yes, I did, I loved it, I loved it like l loved Shell, and I keep being surprised that others don’t love them like I do!